A couple of weeks I was asked about potential ways to collaborate with reputable sites. I put some thought into that before responding that simply an association with me could bring a site to disrepute, but my thoughts on communication persist. From the belligerent uttering of a federal Minister on a Sunday talk show, to a media blitz from an organization marketing itself as expert on economic tools to reduce carbon emissions, to the Ontario report I'll feature in this commentary, it's been as if a convention of climate change alarm is occurring. Comic Con (short for convention) is a really big event now, which makes some sense in this era of communication. Text is a low impact medium - the sites adding audio and video, integrating with podcasts, have a huge advantage. As the comic and related genres (science fiction, fantasy and superhero) grew from print to screens of all sizes, the graphics and sound growth has simply piled success onto success. The term "simply" recognized almost all characters can be grouped into good or bad. Perhaps due only to my musing about communication, collaboration and branding, I thought the polarized nature of climate, and energy discussions, make Comic Con a model for communication and promotion in the 'clean tech' industry. I'd prefer to be a hero, but realize the model needs villains too. What I hope will be found in my little section of this Carbon Con is data-driven iconoclasm delivered through research, competent data handling, pointed if not visually appealing graphics, and full contact criticism of those blissfully unaware they deserve to be blisteringly opposed. What many will find is villainy - I've been accused as anti-wind, anti-renewable, anti-conservation, pro-nuclear, disrespect and misogyny. I don't agree with that entire list, but I'm okay with being the villain if it makes for better heroes. My concern with the profession of professing concern about carbon emissions begins, as most things do, with religion. Once upon a time, in front of a roomful of engineering type people and speaking to something about the impact of greenhouse gas emissions on advocacy (for nuclear power), I invoked Pascal's wager. I wrongly assumed most people would know of the wager, but happily found many got a chuckle from my interpretation/explanation of it. The reason people chuckle is choosing faith contradicts what most perceive faith to be. In the modern culture this isn't a problem. Whether or not I represent Pascal's Wager properly, it remains rooted in my mind that people could choose to believe something for personal gain - and the modern wisdom of "fake it 'til you make it" invites participation in any fad where there is potential for enriching oneself. Since I started writing the blog in 2010, it's become apparent that those in Canada professing faith in green things get a lot more than faith given to them. Dianne Saxe was given the position of Environmental Commissioner of Ontario after a long career in Environmental Law following a long education. Her interest in "green energy" issues is apparent in blog posts from early 2009 until her term as ECO commenced on Dec. 1, 2015 - at which time Ontario's public broadcaster titled her ECO-CHAMPION. I may have come to know the name from her glee as appeal after appeal of proposed industrial wind turbine facilities were rejected by tribunal in Ontario, or it may have been from her position leading Windshare while I was revealing what an operational disaster their Exhibition Place wind turbine was. That turbine was to be a community owned demonstration of wind power in populated areas. It was gifted a contract years after construction and, still under-performing, became publicly bailed out (by Toronto Hydro) at, as far as I know, never revealed cost. The recently released report by the ECO this April is titled Making Connections: Straight Talk About Electricity in Ontario. I have been trying to talk straight on the same topic since 2010, so I felt compelled to look at the tale as written by an ECO-CHAMPION. The least surprising, but most disappointing, aspect is the report does exactly what I pessimistically expected it to: it uses research only to support the bias held by the ECO - which is the worldview that got her the job. That said, it is a really well assembled, eye-catching document and, due to the ECO-CHAMPION's communication with conservation collaborators at the IESO, it does include some information that I've not seen anywhere else. "Ontario can learn how from other jurisdictions who use much more wind and solar electricity than we do"
Table 6.1 of the report lists these countries with a higher "share of annual electricity generation for 2016": Italy, United Kingdom, Germany, Spain, Ireland and Denmark." None of these have a lower emissions intensity than Ontario's grid - or even come very close. Two of these countries were models for Ontario's disastrous Feed-in Tariff program (which the ECO frivolously claims was "international best practice"). Somehow the ECO believes the way to address climate change is not to be found in Ontario - and yet she's here, in the lowest emissions system, suggesting we have much to learn from the countries we imported our largest policy mistake from. Conservation first is a political slogan now in Ontario legislation including, if I recall correctly, the requirement for the ECO to report on progress in conservation (which the system operator also regularly does). While it's a position required to acquire rich public sector work, it may also be nonsense. The following graphic from the ECO's report indicates, to me, that in the absence of the 23.5 terawatt-hours (TWh) deemed generated by vRES(13.5 TWh) and conservation (10 TWh), only 7 TWh serviced demand in Ontario - as only that would be required to be substituted with generation from natural gas power plants. The IESO has calculated that the ICI reduced peak demand by 1,300 MW in 2016. The ICI is the Industrial Conservation Initiative, which rewards one class of consumers (Class A) for reduced demand during a set of peak hours by shifting costs to another group of consumers (Class B). The system operator may see the program as having no net cost, but in 2016 it added $980 million in costs to "Class B" ratepayers. If the program accomplished 1300 MW of peak demanad reduction, it came at a spectacularly high cost, to the Class B group, of $754 thousand dollars per megawatt (year) of capacity. On a ridiculous side-note, for 2017 the IESO shows a "Variance Account under Ontario's Fair Hydro Plan" growing $1.3784 billion in 2017. I calculate $1.185 billion shifted to class B ratepayers from Class A, so I'll note that full amount was then shifted to future ratepayers - who will be forced to pay it all back with plenty more added as interest. At the 2016 ICI cost shift of $980 million, the claimed 3,602 MW of peak demand reduction has a capacity cost of 272,000/MW, which is high by itself, but there were other conservation costs too. The $467.1 million share of global adjustment charges push the actual cost of conservation to class B consumers to about $402,000 per megawatt. The capacity contributions of wind and solar look very low, but this is in part because installed capacity is simply not a good measure of the average amount of electricity that wind and solar projects produce. Capacity credit is a complex issue I would expand on here except to note it isn't an average output, and to date Ontario's electricity procurement of vRES has been in addition to supply meeting capacity needs. Ontario sells its surplus power to other jurisdictions for more than it costs to make that power. So why do people sometimes say that Ontario sells surplus power at a loss? Because of confusion between the cost to have something available and the cost to use it on a particular occasion. Economists call this the difference between average and marginal costs. Theoretically one could procure all capacity needs and then buy only required electricity at just the marginal cost - but only a small portion of Ontario supply is procured that way. Wind, solar, nuclear, most biomass and probably all hydro receive either contracted or regulated payments by unit of output: a megawatt-hour of wind procured by a feed-in tariff contract is $135. 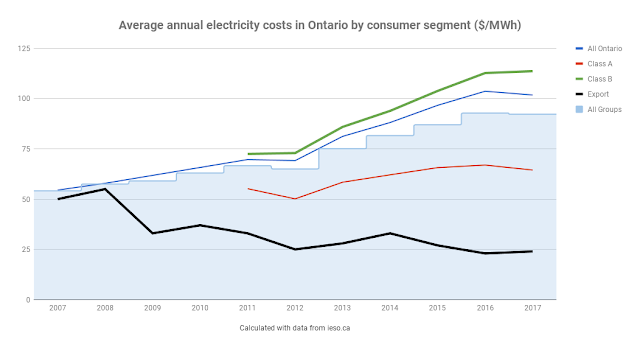 That almost the entire $135 is due to fixed, and not marginal costs, is irrelevant to the Ontario ratepayer that needs to make up for the supply dumped below that price. Since the recession gutted demand in 2009, the average price paid by exporters has moved from roughly what all paid to less than a quarter of the average paid by Ontario consumers: at under 2.5 cents per kilowatt-hour the price paid by exporters is 37% below the regulated price of Ontario's cheapest supply, which is its regulated, publicly owned, hydroelectric output. There is a very strong argument to be made that Ontario consumers are better off receiving something instead of nothing on exports. That argument should not be perverted to support wasteful spending on unnecessary supply - and conservation. 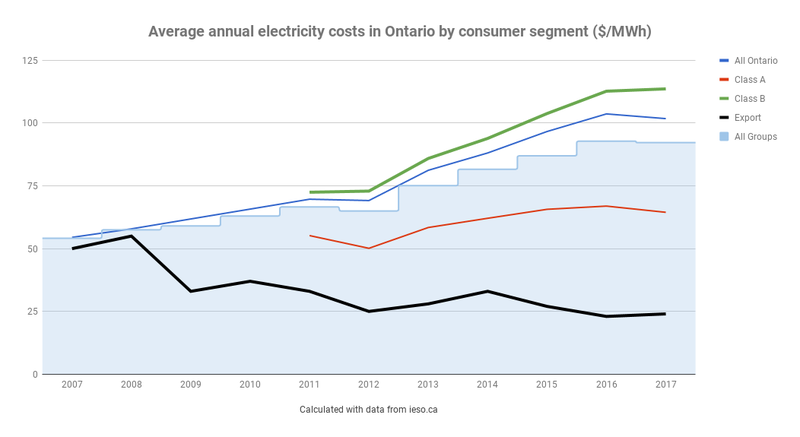 The average class B consumer is charged 20% more than the average cost of supply in Ontario, but 25% of that higher payment is now deferred to fall on future ratepayers, with interest. I suggest the Ontario Environmental Commissioner is placed in the position for the version of Pascal's Wager practiced by the religion known as the Soft Path. That Path has brought many rewards for many decades - including a very comfortable salary and staff to produce an eye-catching, heavily researched, and quite ridiculous report. next up at Carbon-Con: It's only economics. 1. I was please to find annual "curtailment compensation" in Figure 7.8, although I found the accounting unlikely (see A rare accounting of the cost of curtailed electricity supply in Ontario). Following the Renewable Energy Supply program, the noncompetitive Renewable Energy Standard Offer Program for projects under 10 MW, resulted in 284.9 MW of long-term wind contracts at 11¢/kWh.